This edition features the ruins of the Palast der Republik (Palace of the Republic) along the River Spree in former East Berlin. 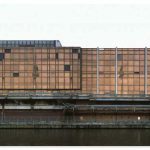 This infamous and ill-fated building is an important work of modern socialist architecture, with a 180 metre long facade of bronze glass windows. Completed in 1976, it was built primarily as the seat of East German parliament and was also a popular dance and leisure facility. Despite heavy protest, it was closed in 1990 and is now demolished. Bomford photographed the Palast in a skeletal state, capturing its grandeur and fragility as a ruin.